The single appeared on The Joshua Tree album and Best of 1980-1990/B-sides compilation. Originally the song Red Hill Mining Town was to be the third single off the album but U2 decided to release Streets instead. The single version has a shorter intro and ending than on the album. The rarest format is the 12" version which includes a lyric sheet to the b-side Silver and Gold. The single peaked at No. 4 on the UK singles chart and came second in the 1987 Rolling Stone Magazine Readers Picks for Best Single. Prior to the start of The Joshua Tree tour, U2 filmed a video for the single on top of the Republic Liquor store located at 7th and Main in Los Angeles, California. A live version of Streets performed on July 18, 1997 at the Rotterdam PopMart concert appeared on the EP PopHeart Live. 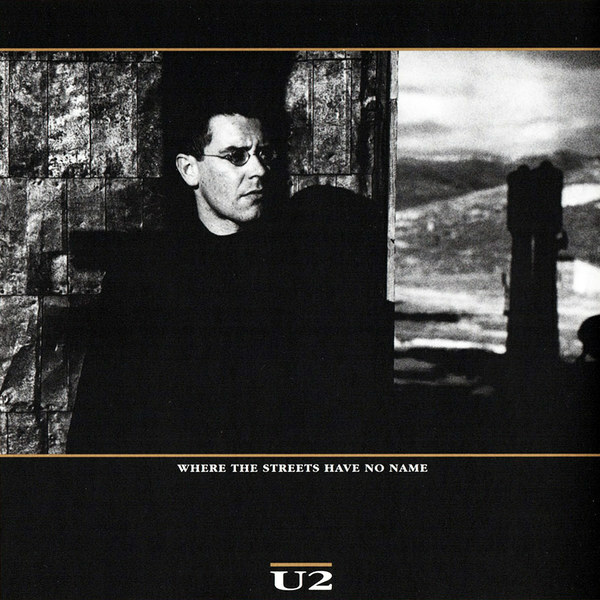 'Where The Streets Have No Name is more like the U2 of old than any of the other songs on the LP, because it's a sketch - I was just trying to sketch a location, maybe a spiritual location, maybe a romantic location. I was trying to sketch a feeling. I often feel very claustrophic in a city, a feeling of wanting to break out of that city and a feeling of wanting to go somewhere where the values of the city and the values of our society don't hold you down.